The present global monetary regime is based on floating among the major advanced countries. A key underlying factor behind the present regime is credibility to maintain stable monetary policies. The origin of credibility in monetary regimes goes back to the pre-1914 classical gold standard. In that regime, adherence by central banks to the rule of convertibility of national currencies in terms of a fixed weight of gold provided a nominal anchor to the price level. Between 1914 and the present several monetary regimes gradually moved away from gold, with varying success in maintaining price stability and credibility. 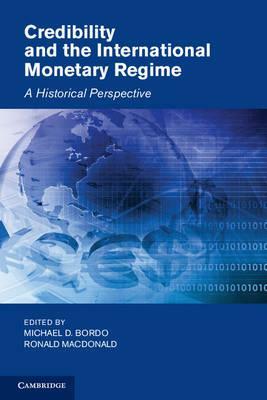 In this book, the editors present ten studies combining historical narrative with econometrics that analyze the role of credibility in four monetary regimes, from the gold standard to the present managed float. Part I. Introduction: 1. Credibility and the international monetary regime: theoretical and historical perspectives Michael D. Bordo and Ronald MacDonald; Part II. Classical Gold Standard: 2. Credibility and fundamentals: were the classical and inter-war gold standards well-behaved target zones? C. Paul Hallwood, Ronald MacDonald and Ian W. Marsh; 3. Interest rate interactions in the classical gold standard, 1880-1914: was there any monetary independence? Michael D. Bordo and Ronald MacDonald; 4. Realignment expectations and the US dollar, 1890-7: was there a peso problem? C. Paul Hallwood, Ronald MacDonald, and Ian W. Marsh; Part III. Inter-War Period: 5. The inter-war gold exchange standard: credibility and monetary independence Michael D. Bordo and Ronald MacDonald; 6. Crash! Expectational aspects of the UK's and the USA's departures from the inter-war gold standard C. Paul Hallwood, Ronald MacDonald and Ian W. Marsh; 7. Did impending war in Europe help destroy the gold bloc in 1936? An internal inconsistency hypothesis C. Paul Hallwood, Ronald MacDonald and Ian W. Marsh; Part IV. Bretton Woods Period: 8. Sterling in crisis: 1964-7 Michael D. Bordo, Ronald MacDonald and Michael J. Oliver; Part V. The European Monetary System: 9. On the mean-reverting properties of target zone exchange rates: some evidence from the ERM Myrvin Anthony and Ronald MacDonald; 10. Credibility and interest rate discretion in the ERM Hali Edison and Ronald MacDonald. Michael D. Bordo is Professor of Economics and Director of the Center for Monetary and Financial History at Rutgers University, New Brunswick, New Jersey. He is a Research Associate of the National Bureau of Economic Research, Cambridge, Massachusetts. He holds a BA from McGill University, an MSc(Econ) from the London School of Economics and a PhD from the University of Chicago. He has published many articles in leading journals in monetary economics and economic history. Recent publications include A Retrospective on the Bretton Woods International Monetary System (1993, with Barry Eichengreen); The Defining Moment: The Great Depression and the American Economy in the Twentieth Century (1998, with Claudia Goldin and Eugene White); Essays on the Gold Standard and Related Regimes (Cambridge University Press 1999, paperback 2005); and Globalization in Historical Perspective (2003, with Alan Taylor and Jeffrey Williamson). Ronald MacDonald is currently the Adam Smith Professor of Political Economy at the University of Glasgow. He is also a Fellow of the Royal Society of Edinburgh, Research Fellow of the CESifo Research Network Munich and an International Fellow of the Kiel Institute of Economics. He holds a BA in economics from Heriot Watt University, Edinburgh and an MA and PhD from the University of Manchester. He has published widely in the areas of macroeconomics, monetary economics and international finance in journals such as the Journal of Monetary Economics, the Journal of Money Credit and Banking, the Economic Journal and the European Economic Review. His recent books include Exchange Rate Economics: Theories and Evidence (2007); The Political Economy of Financing Scottish Government (2009, with C. Paul Hallwood); and Currency Union and Exchange Rate Issues (2010, with Abdulrazak Al Faris).